The American Cancer Society honors volunteer cosmetologist for dedication to lifting the spirits of cancer patients. 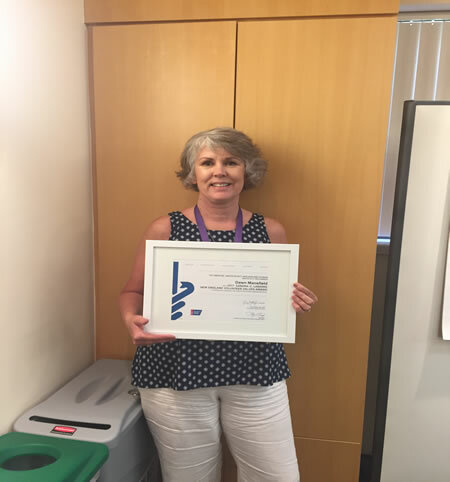 The American Cancer Society honored Dawn Mansfield of Raymond with a Sandra C. Labaree Volunteer Values Award for the New England Division of the American Cancer Society. The award is the most honored accolade by the Society in New England, and it recognizes Mansfield’s remarkable accomplishments in support of its mission to celebrate lives, to save lives and to lead the fight for a world without cancer. Ten years ago, Mansfield became a volunteer cosmetologist for the Look Good Feel Better program, a free, non-medical, salon and product-neutral program offered through a collaboration between the American Cancer Society, the Personal Care Products Council Foundation and the Professional Beauty Association. The program offers complimentary group, individual and online sessions that teach beauty techniques to help cancer survivors face their diagnosis with greater confidence. She is based at Exeter Hospital in Exeter, N.H. While Mansfield volunteered initially as a way to give back to the community, she has participated in several Society events around New Hampshire, including Relay For Life and Making Strides Against Breast Cancer, since then. Dawn Mansfield of Raymond, N.H., received the Sandra C. Labaree Volunteer Values Award for the New England Division of the American Cancer Society in early June 2017. For more information on how to become a volunteer for the American Cancer Society or about the Society’s programs and services, please visit www.Cancer.org or call 800-227-2345.